A learning thermostat is no use for my needs. My consulting work causes my schedule to be all over the place. I can be at home on different days of the week and at different times on the days I am at home. I installed my own Home Automation System (using HomeSeer and Z-wave) and use Kindle Fires, Logitech Harmonies and iOS devices to control it all. (More details are available here: Using the Kindle Fire as a Home Automation Touchscreen.) If I had the budget for a Crestron system or the like, and the programming and support costs that go with it, the integration with a thermostat would probably have been better. That said, I have some friends with big houses and pro-installed, connected thermostats and they’ve reverted to conventional units. There’s no way I wanted to be without heat, TV, Music, or have the house unsecured/unprotected if something failed. With a slight exception (the Z-wave thermostat), I achieved all these goals. I bought a DSC alarm system, installed it and integrated it with HomeSeer. It works perfectly and should the HomeSeer system be offline for any reason the alarm functions normally. I use Windows Media Center with SiliconDust tuners for my TV and DVR. (I’m a cord cutter: you can read about that here: A Year without Cable.) . All my AV gear is in the basement (for first floor) and an upstairs closet (for 2nd floor) and is controlled with Logitech Harmonies. (I will be switching to URC with an MSC-400 controller soon.) I do not want this controlled by my Home Automation system, but I do want the lights to dim/raise when I play/pause/stop movies, etc. and the ability to turn on specific sets of lights from the Harmony One remote for bathroom/cocktail breaks. This works great and, more than a year later, still makes me smile when I pause a movie and the lights come up, then dim again when I press play. For music, I use Sonos. I initially bought a basic system with two zones and controller. I now have six zones (soon to be seven), three CR100 controllers (they got real cheap when the CR200 came out) and can control it with my iOS and Android devices too. Originally my system was distributed, so Sonos fit the bill perfectly. After buying the “new” house, we gutted the first floor, stairway and second floor hallway. A semi-finished basement and lots of knob and tube wiring, presented the opportunity (and need) to rewire the entire house, so I home-ran everything and ran lots of conduit from basement to attic for future needs. Because all the speaker wires are home run (largely because of passive in-wall and outdoor sub-woofers), I could easily install a multi-channel amp to reduce the footprint of the music component. Given that I already had the Sonos system and love it (and the fact the company has a singular focus), there’s a good chance I’d buy Sonos again if I was starting from scratch. The Sonos system is integrated with HomeSeer, primarily for the purpose of having it muted when the bedtime and away events (alarm armed away, etc.) are run. It also mutes the music, makes text to speech announcements when stuff happens around the house, and then resumes. There was no status reporting, so I had to continually poll it or manually refresh it. Once paired with a Z-wave controller, the thermostats touchscreen could not be used to adjust temperature. This was a bit of a shock. It wasn’t clear at all in the sales literature. WAF would be heading downhill soon. Despite the above, I continued. I bought a HomeSeer plug-in to interface it with HomeSeer. This worked well. I could configure an unlimited number of schedules and adjust the temperature from my mobile devices. The set point was lowered when the alarm was armed away and raised when it was disarmed (if we didn’t raise it from a mobile device before coming home). When we were away for the weekend or on vacation, I simply ran my vacation event and it set to a low temperature until we returned. The lack of control from the thermostat itself and reliance on the Home Automation system being up, meant it was time for a change this winter. There were a few other factors that drove the decision to change. A plumber came to replace the igniter on the furnace. My wife had left her phone at work and I had to connect remotely to adjust the temperature to test it, as this couldn’t be done at the thermostat. I really wanted something where the schedule was in the thermostat (not on the server) and the thermostat’s controls were functional when paired. With more experience under my belt, I was able to set some clearer requirements. Must be able to change set point and mode (heat/off) from Home Automation system. 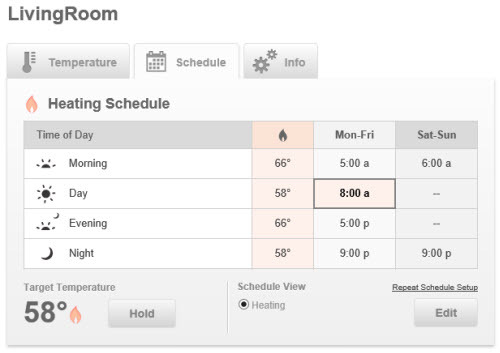 Thermostat must work if Home Automation system goes offline (i.e. schedule must be in the thermostat). Thermostat must be controllable locally when paired. The CT30 with Z-wave worked OK, but status was never accurate and when there were issues with network or server, I had no heat. No fun if you have to get up for a flight at 4:30am in Chicago in the middle of winter. None of the shortcomings were due to Z-wave itself, jus the implementation in this product. So the big decision was to stick with Z-wave or move to Wi-Fi was the big decision. I either wanted a Z-wave thermostat that did not have the limitations of the 2GIG device or a Wi-Fi model that would integrate with HomeSeer. I found it very difficult to get accurate information on exact feature sets. The CT30 I had supports USNAP modules, so I could just switch out the Z-wave module for a Wi-Fi version. A HomeSee plug-in developer had created a plug-in that worked with a Wi-Fi version of the CT30, but I was so disappointed with my CT30, I didn’t want to entertain anything from the same manufacturer, or so I thought: turned out I was flat out wrong about that. I’d seen quite a few Wi-Fi controlled thermostats (like Nest) and they all had pretty cool apps, but if I was going that route, I absolutely wanted something that would interface with my Home Automation system (primarily to override settings based on alarm conditions). Should I get back on the Z-wave horse? I heard good things about the Honeywell TH8320ZW1007/U. I read the installation guide and it did allow the schedule to be set locally when joined to a Z-wave network, and remained operable via the unit. It seemed to meet most of my criteria, but my gut was still telling me to go for Wi-Fi. It looked like Wi-Fi had won the race. I decided to see what it would cost to swap the USNAP module for a Wi-Fi version. I didn’t mind speculating $20-30 to try it out. I was shocked to find that the Wi-Fi module costs over $70, which is almost 70% of the street price for the entire thermostat. I was chatting to the developer of the HomeSeer plug-in (Beakerstat) for the Wi-Fi version of the CT30 to see if his plug-in, coupled with the CT30, would meet my requirements. He’d never tested it the way I wanted to use it, so he offered to mail me a spare Wi-Fi module that he had if I was willing to test for him. Naturally, I agreed. Configuring the iOS app was a breeze too. Once connected, the device configuration and schedule can be viewed/changed, and ad-hoc set point and mode adjustments can be made. The app work flawlessly when connected via the local network or via a cellular data connection. The web portal is equally well designed. There is a free service that allows control of the thermostat. Temperature Alerts: Real-time high and low temperatures alerts for your thermostat sent to you via email. Helps prevent frozen pipes and costly plumbing bills. 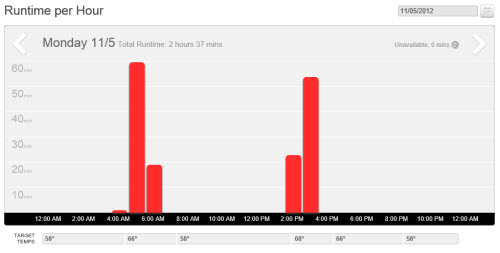 HVAC Runtime: Monitor your HVAC system's performance. Find out just how much your heating and cooling system is running each day and why. Review historical data on the web or your mobile device. Neighborhood Comparisons: See how you stack up. Learn how your heating and cooling use compares to other wireless thermostat owners near you. Was WI-Fi the Right Choice? For me, yes. I’ve been using it now for about 4 weeks and it works great. WAF is through the roof, which will help with future project budgets. I’m very happy with it too. I have control via a polished app on my iOS devices and integration with my Home Automation system. The two work in perfect harmony. A gut feeling steered me towards Wi-Fi, but I was shocked at how few products were available with open API’s. For people on a regular schedule, a learning thermostat may be adequate, but with an erratic schedule like mine, it would be hopeless. By integrating with my alarm system (via HomeSeer), I don’t have to do anything different to get optimal energy savings. Most importantly, it met my main goals: it can operate independently of Home Automation system (if required) and can be controlled fully via the unit or the iOS app. At just over $100, and zero subscription fees, it’s a great deal and I’d highly recommend the product to anyone. For those using HomeSeer, the Beakerstat plug-in I’m using works great too.